This year I had the great fortune of attending the World's 50 Best Bars awards ceremony, the Academy awards of the cocktail world. 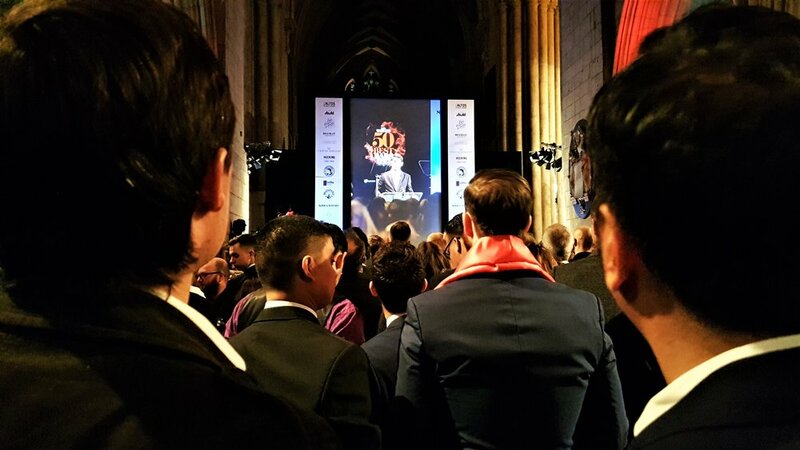 The event took place in the beautiful Southwark Cathedral in London on October 5th. This year W50BB has joined forces with the World's 50 Best Restaurants headed by William Drew. One of Will’s first changes was to come up with a more diverse array of voters, drawing on the opinions of journalists, bloggers and jetset barflies. The 505 academy members were asked to select their favorite 7 bars, with a maximum of 4 bars from their own country with the requirement that they've visited the bar in the past year and a half. Just before the event, I did some last minute bar hopping with my Italian buddies Diego Ferrari and Giampiero Francesca. After visiting Bar Termini, Swift and Scarfes bar in the Rosewood hotel, we headed for the Southwark Cathedral in a taxi. Being at the awards ceremony was an unbelievable experience. All my bartending heroes were all in attendance. Everyone was dressed elegantly except perhaps for me, as I didn't realize what the "cocktail" dress code written on the ticket meant. 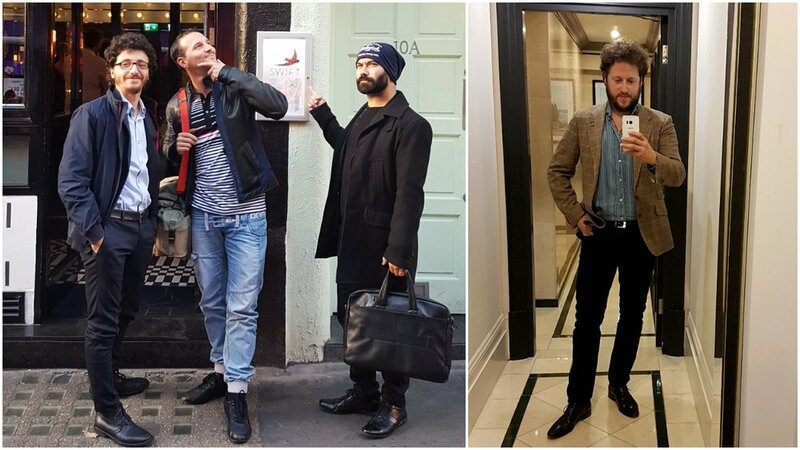 Earlier in the day, I scrambled to find some dark jeans for the event and funnily ran into Luke Whearty at a Shoreditch jeans store who was facing the same problem as me. Counting down from 50 to 1 was exhilarating although a little bit stressful. I anxiously watched my industry friends from Singapore, London, Italy and the USA suffer through the countdown, as they prayed for the best possible ranking for their respective bars. In addition to the World’s 50 Best Bars being named, there were also special awards handed out. Julio Bermejo unfortunately couldn't make it but his sister was there to accept the Industry Icon award on his behalf. The Bartenders’ Bartender award for 2017 went to Ian Griffiths of Trash Tiki, also partner of Ryan Chetiyawardana at Dandelyan. After the dust settled, American Bar was named number 1 bar in the world. Although I've never had the pleasure of visiting this cocktail institution, the overall consensus amongst my industry friends is that they fully deserve the throne. The biggest news of the list was Native, a dark horse entry from Singapore. Native is a regional ingredient-focused bar opened on a shoestring budget by Vijay Mudaliar and his friends. Native, which you can read more about below, is proof that you don't need a big spirits company backing you or deep pocketed investors to be one the World's 50 Best Bars. Although I’m no match for Nico de Soto who has visited every single one of the World’s 50 Best Bars, below I give my impressions of the 17 bars I’ve been to on the 2017 list. Tommy's Mexican restaurant is managed by legend Julio Bermejo, a great host and one of the friendliest people you will meet in the bar industry. He is the world ambassador of tequila thanks to is amazing knowledge of the agave-based spirit. As soon as you enter Tommy's, Julio and his head bartender Greidy will make you will feel at home. Start off with a Tommy's margarita, prepared with the freshest limes in the world using an interesting blender shaking technique. Then, let Julio guide you through his world's largest collection of tequilas. Vijay was inspired to work with ingredients he grew up with like mango, turmeric, cinnamon, and tapioca. He is also into foraging new ingredients for his creative drinks with one interesting example being the weaver ants used in the Antz cocktail (Chalong Bay Thai rum with aged sugarcane vinegar, coconut yogurt, salt-baked tapioca and soursop topped with ants on a frozen basil leaf). Believe it or not, this drink is delicious. The ants add a pleasant acidity (and crunchiness) to the savoury drink. Vijay's decision to source locally goes against the grain in Singapore, where restaurants and bars too often use ingredients that are shipped from lands far away. The regional concept at Native extends even beyond the drinks, with bar aprons, decorations and music all provided by local artists. 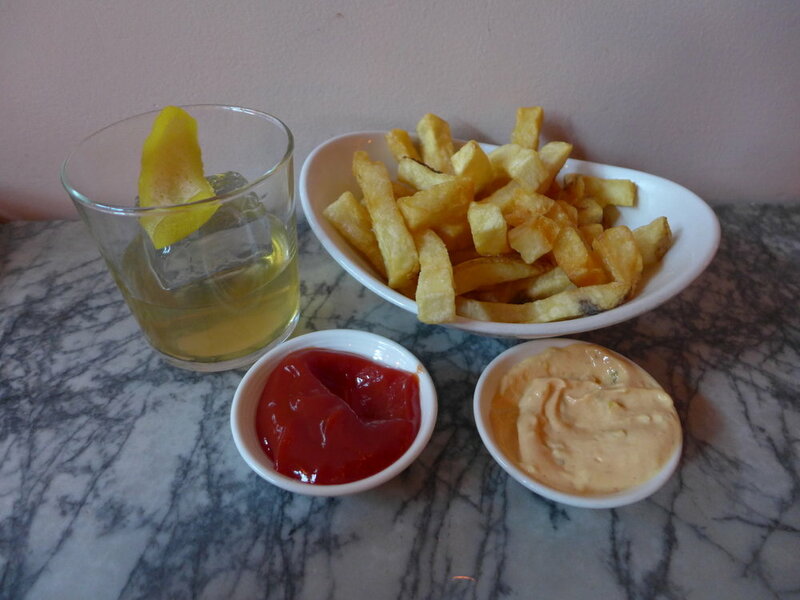 Located in the Mission, ABV is casual, unpretentious and offers the best drinks in the city. The atmosphere is welcoming at ABV: it's simple but stylish. My favorite drink at ABV is green in color: the simple but refreshing Tarragon Collins is made with gin, lemon, tarragon and soda. There is no better drink to start your evening. You'd expect to find tarragon in Bernaise sauce or an Asian meat dish, but the pungent herb works great in this delicious and fragrant cocktail. On the opposite end of the spectrum is the Whisky Church with a manly scotch, oloroso maple, and smoked cherry bitters. It's not easy to drink but it is the perfect finish to an evening. I also had a delicious Whisky Sour, Remember the Maine and Rye-based Sazerac from Cecily. ABV has recently opened a more exclusive bar upstairs, but that experience will have to wait for my next trip to SF. When you will first enter Syndicat, you will be shocked. Was this bar designed by a frat boy high on shrooms? The tacky but alluring golden curtains, the coins wedged into the ceiling and a back bar that is walled with pegboard which seems perfect for hanging your dad's wrench set. But instead of tools, there are bottles of French-only spirits, liqueurs, and bitters. Le Syndicat was one of the first bars to strongly embrace products from their region, a welcome trend in the bar industry. Scout in London, Native in Singapore and Iter in Milano have since followed in Le Syndicat's footsteps in supporting local ingredients in their drinks. In addition to supporting French liquors, Le Syndicat’s menu supports the Paris scene, with each cocktail dedicated to a different Parisien bar. This is one strong sign that in Paris, the bar community is a closely-knit family. We tried the Pandan in the Air, an ode to Nico de Soto’s favorite ingredient at Danico. This cocktail even comes with a Helium-filled balloon that you can inhale to impress your cocktail friends with your Tweety bird voice. My favorite drink was the Undergroni, dedicated to Calbar. But what stood out even more than the drinks was the vibe. From the customers to the bartenders, everyone was in a lively party mood. I made three friendships in my 30 minutes at Le Syndicat while the bubbly Juliette and charming Giovanni kept us smiling with their incredible enthusiasm. In terms of overall experience, Le Syndicat is my favorite bar in the city. Why is Jerry Thomas Speakeasy in the world's 50 best bars? It's quite simple – together with 28 HongKong Street in Singapore, this is the sexiest cocktail bar in the world. From the moment you make it past the mysterious but intimidating door ritual, this bar will blow you away with its beauty and charm. The wallpaper, the couches, the bar, the bathroom, the waitresses - everything here is eye candy. The staff do a great job managing this often-packed little speakeasy and the 3 barmen work wonders in their cramped stations behind the bar. Tippling Club opened during difficult financial times in 2008. But star chef Ryan Clift persevered, and has inspired a new revolution in cocktail making which he skillfully pairs with his inventive cuisine. Ryan has guided an impressive list of bartenders who have all gone on to great things for Singapore’s flourishing bar industry. Joel Fraser, Luke Whearty, Yugnes Susela, Kamil Foltan and Zachary De Git have all been former head bartenders at Tippling. Behind the stick at Tippling these days is ex-Savoy bartender Joe Schofield. Joe came up with my favorite cocktail menu of the year where you pick your drink based on perfume sticks placed on a cocktail strainer. Choose between aromas like leather, forest, jasmine, caramel, and earl grey. The accompanying cocktail will give you a similar sensorial experience as the perfume stick. I adored the Caramel cocktail featuring aged rum, Myers, lemon juice, salted caramel, egg yolk and salt. I can’t wait to try the new menu, based on gummy bears. Trick Dog is known for its creative menus, cool atmosphere and hipster-friendly Mission location. I finally had the good fortune of visiting Trick Dog this year. My favorite cocktail was the Biggie and Tupac (1 oz tequila ocho reposado, 3/4 oz hidalgo amontillado sherry, 3/4 oz maurin blanc vermouth, 1/4 oz honey, 7 dashes jasmine and sage tea with meyer lemon). I enjoyed the casual drinking den where it was easy to strike up a conversation with both the customers and the bar staff. The night was capped by meeting the bar manager Morgan Schick - a perfect gentleman who kindly called me a cab on his cell phone to get me to my next destination, Tommy’s Mexican restaurant. Owners Paul, Spencer and Snehal met 10 years ago while doing law gigs in NY. They all shared a common passion for cocktail bars, and were particularly inspired by the drinking institution Employees Only. Pursuing various new ventures in booming Singapore, they decided to put some cash together to come up with 28 Hong Kong Street, a NY style cocktail bar in a country with almost zero drinking culture. The big risk paid off. In their first year they made the World's 50 best and have now hit the list 6 years in a row! 28 paved the way for many new cocktail bars in Singapore, even if Tippling laid the initial ground work. 28 HongKong street is the sexiest and best run cocktail bar in Asia and their new drink list is their best yet. My favorite cocktail at 28 is The Horse with No Name featuring Purasangue Tequila Blanco, Pineapple, Bell Pepper, Lime, Jalapeno and Cilantro. The Horse with No Name is a spicy and fragrant drink that will blow your mind. In addition to the great cocktails, 28 offers the best bar grub in the country, focusing on delicious American-inspired comfort food. To find Operation Dagger, look for a rectangle and inverted crown symbol. Once through the door, a seedy cement staircase will lead you down to the minimalist basement speakeasy. The light bulb installation will have you gazing up toward the ceiling but bring your focus back to the man behind the bar, Luke Whearty, a bartender who has taken mixology to the next level. Luke’s menu at Operation Dagger makes no mention of the spirits, so the customer can focus instead on the other ingredients that provide the soul of a cocktail. You will also notice nondescript brown bottles behind the bar, some of which contain spirits that are redistilled and infused with new flavours. Just like his menu, Luke’s goal is to take the emphasis away from brand names and preconceived biases, allowing his customers to better experience the intricately woven flavours that make up his drinks. Check out his signature Hot and Cold. You’ll need to sip through the warm coconut/white chocolate cream before you get to the cooler base of tequila infused with pineapple and lavender. This drink is a pleasant surprise your palate and happens to be Luke’s best seller. From the new drink list, which Luke also showcased at his week-long takeover of Matt Whiley’s Scout, be sure to check out Truffle with white chocolate, mandarin vinegar, truffle, oak and coriander. 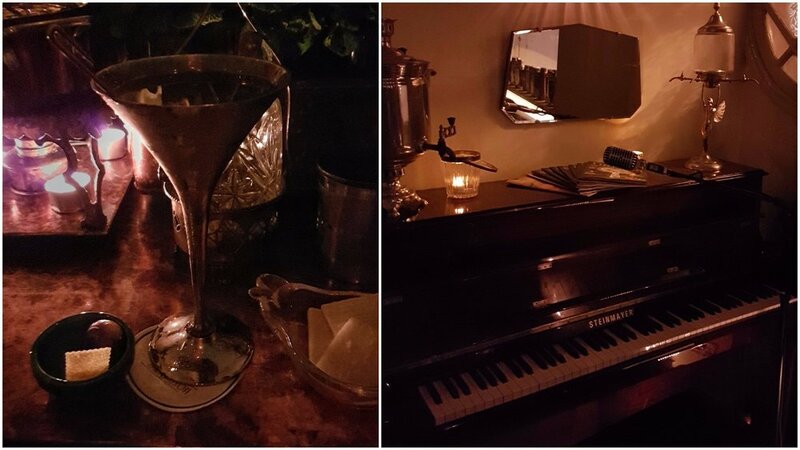 The Gibson is exactly what a cocktail bar should look like: an intimate, dimly-lit space, a sizeable but not overly long bar counter, and a vintage piano, complete with a talented pianist. I tried the signature Gibson martini – it was one of the best of my life. A great bonus at Gibson is the jar of pickles and small plate of cheeses served alongside your drink. Marian is a sight to behold as he prepares his cocktails, which vary from twists on classics to wild new creations. I’d like to give a special mention to the staff, who were extremely polite, always kindly asking permission before passing by our big crowd standing up at the cramped bar. One of the best entrances in the world leads down the stairs to Oriole, a magical "speaky tiki" bar. Although I only had a very short visit, I was enthralled by the experience up at the bar - with two world class drinks, presented beautifully on the best coaster in the game. Luca Cinalli is mesmerizing to watch. His style and technique will blow you away. His elegance and speed while preparing his drinks and his signature crossed wrist shake will leave you in awe. At 15th place, ATLAS takes home the Highest New entry prize at the ceremony. As you enter ATLAS, your eyes will be uncontrollably drawn towards the 15-meter high ornate ceiling. The highlight is a 3-storey high gin tower, which in the previous incarnation of the lobby was a backbar for holding wines. One of the biggest tasks of the lobby makeover was given to Master of Gin Jason Williams, who was responsible for curating and accumulating the largest collection of gin in the world. He told me many gin distillers, inspired by the vision of a great gin bar in Asia, personally contributed bottles to the collection. In addition, many other gins were transported to Singapore by loyal friends and family. Proof estimates there are now at least 2,000 gins in the world and as of the gala launch, ATLAS bar had secured 1,011 of them. The head bartender at ATLAS is Roman Foltan, who previously worked at the Artesian in London which won World’s Best Bar for four consecutive years. Roman’s drink list includes the signature ATLAS martini (London Dry Gin, Mancino Bianco Ambrato Vermouth, orange bitters and champagne vinegar). There is also the Imperial Fizz Nouveau (modern French gin, rose cordial, angelica, orange blossom, cream, citrus, soda) prepared using the innovative Imperial shaker machine designed by Jason Crawley. Headed by Hidetsugu Ueno who is famous for the hard shake and his ice talents, you can’t miss out on Bar High Five when in Tokyo. The bar is beautifully decorated with thick and dark wooden panels, with at least a dozen bar stools, all of them facing the long counter. The bottles on display behind the bar were beautiful, with an amazing selection of spirits from Japan and rest of the world. Since the bar counter is really long, one would doubt where to sit to get the perfect view of Ueno's cocktail making. Actually, you can sit where ever you want as Ueno alternates between two strategically placed stations, so that everyone gets a good view. There is no menu at High Five. The order is based on your preference, style, taste and mood. Bar High Five is worth a visit and is definitely a place to hang out with other cocktail appreciating tourists in Tokyo. Ueno is a busy man and could very well be on tour, so make sure you consult his travel schedule located on the bar’s web site. Little Red Door is without a doubt the most famous bar in Paris. Entering the dimly lit and romantic bar, you will be greeted with a beautiful smile from the team. Keila explained their incredible menu based on architectural movements such as Minimalism, Biomimetics, Brutalism, Baroque and Art Deco. Our favorite drink on the night was the Functionalism. Although I didn’t gain access to the beautiful bar area with its best-in-town bar stools, I enjoyed meeting some new friends at one of the tables. Little Red Door is surely the sexiest cocktail bar I visited in Paris. Congrats to Remy Savage and friends for a great conceptual menu. Bar Termini is a simple but brilliant idea. It aims to be a slick Italian café, but situated in London’s Soho district. And the baristas at Termini pull it off. The team are all dressed in beautiful white aprons and will trick you into thinking you’re in a Roman café. Cafés in Italy are actually called “bars”, and typically offer not just coffee and cornetti, but panini, cold cuts and great mixed drinks at aperitivo time. The same is true at Termini, but each of these offerings is executed to perfection. I recommend trying one of their famous Negroni variations. Congrats to Marco Arrigo, Gregory Camillò and the team for their awesome top 10 finish! Manhattan Bar at the Regent is an elegant hotel bar designed by the team at 28 and contains it’s very own rick house, where Philip Bischoff, Cedric Mendoza and his team barrel age cocktails. You will even see signature barrels, with cocktails that have been formulated by the biggest names in the cocktail world. On my most recent visit to Manhattan for Singapore Cocktail week, I had the pleasure of trying Mancino’s barrel aged 21st Century Negroni with none other than Giancarlo himself. At Manhattan, they even have a stylish ingredient lab, where you see an amazing assortment of exotic ingredients that the team is studying for the cocktail menu. The highlight of the bar however is bar itself, where each bottle is individually lit, making for a dramatic experience each time you enter Manhattan Bar. At 7th spot, Manhattan takes home the Continental bar award sponsored by Michter's for Asia's highest ranking bar. Look for Manhattan to challenge the big boys from NY and London next year. Walking into Dandelyan, I expected to find another typical stuffy hotel bar but it was completely the opposite. The whole night was pure happiness. From the greeting at the door, to my great interaction with the bartenders still had time to chat despite the speed at which they had to pump out drinks, to the amazing goodbye, it was a truly night to remember. The drinks are world class at Dandelyan and are based on the Ryan Chetiyawardana and Iain Griffiths philosophy of sustainable practices. The menu is beautiful, with the last page organizing the cocktails into four quadrants to help you choose your concoction: on the Y axis drinks are sorted from lighter to richer while on the X axis, drinks are categorized based on the time of day. My favorites drinks at Dandelyan are the silky and sumptuous "Sweetheart Sazerac" (Jameson, Redbreast, dock leaf, absinthe and nettle) and from the exclusive Cellar menu, the meditation-worthy "Patron agave sherry" - fermented agave fortified with tequila and rested to give added complexity to the cocktail.